Provide one on one consultation to determine clients goals and challenges. Assess space and design customized solutions to generate long-term organizational benefits that will meet changing needs and enable clients to find what they need when they need it. A more efficient and productive home and office environment will give people the time needed to focus on the other things that are most important to them in life. A clear space allows the ability to see organizational opportunities. Clutter will be eliminated and unnecessary items will be donated or purged. A solution oriented plan will be implemented to help clients maximize and enjoy their home or office space. Each project is tailor made to suit individual specifications. The goal is space optimization. Comprehensive support is given to ensure that the system created is easy for the end user to understand and maintain. Items will be sorted, reviewed, purged, categorized, labeled and moved into a new organizational system. Additionally, practical organizational and time-management suggestions will be provided to assist and motivate clients to successfully maintain their new long-term organizational strategy. Clients will not be forgotten after the project is complete. Everyone will be contacted in a timely fashion to ensure that the organizational system designed is meeting their needs. Meighan’s professional and life experience includes a BS degree in Marketing from Lehigh University and a proven track record of success working at Fortune 500 companies such as The New York Times, Liz Claiborne, and London Fog. 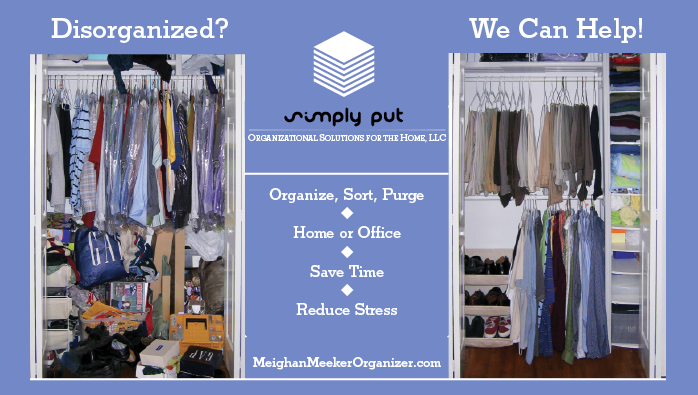 She has nearly ten years experience in home and office organization. space planning, corporate relocation/moving, home renovations, space planning, staging and sbusiness organizing are all part of our specialties.